One of my few solemn and unwavering beliefs is that mankind has never been graced with a greater stroke of genius than The Ham Sandwich. In 200,000 years of – for want of a better word – life, the human race has accomplished nothing approaching the culinary creativity, the artistic acumen or the sheer splendid simplicity of that most cherished foodstuff. It is (in short) the ideal intersection of all the efficiency, economy and ease that modern life necessitates, and the rich, rewarding rapture that fine dining bestows, sprinkled throughout with just a little dash of getting the job done and filling you up damn well for the rest of the good old diem until you get your literal teeth into the next one. Fast, functional and fairly fully flavouricious, It has never once let us down. Woe betide, ladies and gentlemen, were we ever to find ourselves bereft of the good work of The Ham Sandwich, woe betide. Unfortunately, we find ourselves increasingly bereft of the good work of The Ham Sandwich. It must be realised here that the crisis in question has been steadily simmering toward an eruption for years. This is not a sudden, unstoppable catastrophe; this is rather the minimum point of a gradual plunge in global standards that society not only failed to prevent but actively encouraged. Even I allowed this plague to fester under my not-inconsiderable nose for too long without taking notice or action. We are all to blame for the downfall of The Ham Sandwich, and this is a tragic truth up to which we must face if we are to make any vertical progress out of the whacking big hole we’ve so effectively eaten ourselves into. CUSTOMER: I would like a Ham Sandwich, please. TRANSLUCENT INTERN: One Ham Sandwich, coming right up. Take a seat, sir, I’ll bring it down to you in a minute. As you can no doubt see, the entire transaction was extremely straightforward. We see from the first line that Customer delivers the request with absolute clarity and efficiency, leaving no conceivable room for misinterpretation of any sort. Translucent Intern proceeds to step into his role with all the reassuring confidence expected of him. Furthermore, Customer, trusting so much in the ability of even this lowest form of human life to understand seven simple words, dares to express gratitude to Translucent Intern for a service he has not yet fulfilled, anticipating that the only possible outcome could be a positive one. What was delivered to me shortly after the above exchange was what can justifiably be characterised as “Not A Ham Sandwich”. I was presented, rather, with a fully-functional ecosystem in miniature on a plate. Tottering atop my “meal” was the result of a bomb in a greenhouse – there was a base layer of mixed vegetation in sickly greens and offensive purples that would be better suited to a sloth, above which was a stratum of sinister shrapnel from peppers and onions, all capped off with the fattest and most beastly tomato that I had ever had the discomfort of witnessing. Beneath this explosion of horticulture my keen eye detected the presence of some sort of bread product, though that too was diseased with all manner of ghastly seeds and organic enhancements the like of which should never be allowed to stray beyond the shelves of the health food shop to which they have been so wisely confined. When at last I had machetéd my way through the undergrowth with my knife and fork, I finally caught sight of the ham – one withered slice, barely there, scrunched into a corner like something salvaged from the bottom of a wastepaper bin. Having no other choice, I ate what little of the sandwich I could and left as quickly as possible, wondering what on earth the human race was coming to. On my way out, I spied the source of all the strife on a treacherous menu mounted on a wall – there was indeed a meal up there that was slyly labelled “Ham Sandwich”, but if one put oneself so far out as to squint at the small print beneath, one could see that the terms and conditions painted a more realistic picture: “Tomato, Diced Onion And Pepper And – (here the copy writer once again wandered into the realm of optimistic fantasy) – Juicy Lettuce, On A Bed Of Succulent Ham And Buoyant Gluten-Free Bread”. The problem became immediately clear to me. The issue, dear reader, is this – as with so many problems in life, it all comes down to capitalism. The world in which we live is one of constant, fast-paced excitement, where many things, from shoe styles to statesmen, are expected to update themselves relentlessly to meet the newest standards. Sales are not made and money is not earned unless there is a regular flow of original ideas. Simplicity is seen as a sign of weakness and antiquity; every product is encouraged to be bigger and better and prettier-looking in any way possible. 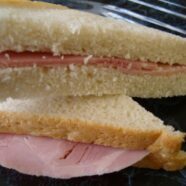 Thus The Humble Ham Sandwich – icon of fine luncheons, steadfast staple of so many generations’ diets, purest form of foodstuff known to man – has met a flowery fate. Society is no longer content with The Ham Sandwich in Its truest form, so restaurants feel obliged to shell It with greenery and revolting relishes and anything else that could make It look fancier. Taste is now irrelevant; the luncheon has become a form of moneymaking Art, nothing more. This cataclysm is not restricted to that one restaurant I visited, it is everywhere; and it is not just restricted to The Ham Sandwich, but affects a great many foodstuffs that the modern luncheoning man would be partial to from time to time. I say, however, that it cannot go on any longer! I say we must restore the ritual of eating to its unspoilt roots before they are wrenched from the ground altogether! I say we must realise that sometimes the nicest things are not the most visually appealing or the most innovative! I say we must respect The Ham Sandwich for what It truly is, and indeed respect foods everywhere for what they are, and never try to make them into something they are not, for that way madness lies. I made some very minor changes, Cian, mostly nearest the beginning. I think the first sentence is better as I have it. Have a look and decide and feel free to change it back if you wish. This is a wonderfully quirky yet soulful and somewhat politically charged commentary on capitalism. I enjoyed it a lot.